The National Highway Traffic Safety Administration (NHTSA) recently confirmed that there is still a need for drivers to be aware of some basic seatbelt safety facts. National seatbelt statistics have improved overall. This is likely due to an increase in seatbelt safety facts being included in national campaigns such as Click It or Ticket. In 2006, 81 percent of individuals buckled up regularly. Front seatbelt use is higher at 81 percent than rear seatbelt use at 65 percent. Rear seatbelt use is especially problematic for individuals aged 70 and older; only 69 percent buckle up. In 2005, more than 15,000 people died in traffic crashes during evening hours and a whopping two-thirds were not wearing seatbelts. Evening seatbelt use decreases about 10 percent from daytime use. The percentage of people unbuckled who were hurt or killed in vehicle accidents, costs the U.S. $18 billion a year in medical, insurance and overhead costs. In 2006, New Hampshire had the lowest seatbelt use at 63.5 percent. Washington had the highest amount of individuals clicking their seatbelts; a whopping 96.3 percent! Besides Washington, 10 other states achieved seatbelt usage of 90 percent or higher -- Michigan, Oregon, California, Puerto Rico, Hawaii, Nevada, Maryland, Texas, Georgia and New Jersey. State statistics vary, not surprisingly by the amount of time and money invested by the state to promote seatbelt safety facts. Results also vary when law enforcement makes it a point to enforce seatbelt laws. For instance, Mississippi made its seatbelt law a "primary" enforcement law in 2006 and Mississippi saw a jump in seatbelt use from 60.8 percent in 2005 to 73.6 percent in 2006. In the past forty years new vehicle standards have been created and safety equipment has been installed. All the safety precautions together have saved over 300,000 lives. One and only one safety feature saved more than half of those lives - seatbelts. While technology advancements in vehicle safety increase and more people take protective driving courses the good old seatbelt continues to save more lives that anything else when it comes to traffic and auto safety. Auto accidents are the number one killer of children ages 4 to 14. In 2005, an average of five children died each day and another 640 were injured daily in auto accidents. The main reason is improper use of seatbelts, booster seats and child restraints. Almost 100 percent of infants and 93 percent of small children currently buckle up in the U.S. The safety problems occur because not enough children are belted properly. A miserable 10 to 20 percent of children who should use booster seats use them. A child in a booster seat is 59 percent less likely to be injured or killed in an auto accident than a child restrained by a seatbelt only. Airbags alone are only 42 percent effective at providing protection. The absolute best combination for adults riding in a car is a lap-shoulder belt with an airbag. 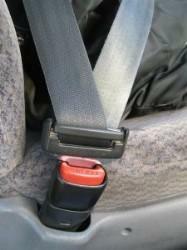 Check all the seatbelts in your car periodically for breaks, frays, looseness and workability. It will cost you far less to fix a broken seatbelt than it will cost if you're in a serious accident with a broken belt. One person to a seatbelt; never double people up. Your shoulder belt should be worn close to your body and over, never under your shoulder. The lap belt should be worn against your body and low across your hips. Pregnant women always need to wear their seatbelts. It will not in anyway hurt your unborn baby. In fact, if you're in an accident, wearing your seatbelt properly is the best way to protect the life in your belly. For further information take a look at this pdf document brochure on pregnancy and seatbelts. Infants, birth to at least 1 year and at least 20 lbs must be in a rear facing infant or convertible seat. Infants less than 1 year who are 20-35 lbs must be in a rear facing convertible seat. Children ages 1 to four years who are 20 lbs to 40 lbs must be in convertible seat that is forward-facing or forward-facing only or a combination seat with harness. Children who are 4 to at least 8 years and at least 4'9" in feet (57 inches) tall should never use only a seatbelt. They must be in a belt-positioning booster with no back or a high back belt-positioning booster. This is the group most neglected when it comes to seatbelt safety. If all the kids and seatbelt rules has you feeling overwhelmed; there are people who can help you sort it out. NHTSA has the most wonderful guide called Is Your Child in the Right Car Seat?. This guide will walk you through everything you ever need to know about kids and seatbelts. The guide is full of easy to follow photos and tips. Additionally, you can go to a free child safety seat inspection site. Each state has them. While you're there, a child seat inspector will make sure you have the correct seat, installed properly and that your child is in the seat correctly. Take the following safety tips about seatbelts into consideration, each and every time you or your family gets into a vehicle. It may just save your life or the life of someone you love.